Latest Release: Nintendo Switch	No ratings yet. Nintendo Switch is an upcoming hybrid video game console developed by Nintendo , and the company’s seventh major home console. Officially unveiled in October 2016. Release Date: March 3, 2017. Nintendo would listen to consumer expectations when setting a price. The CEO also said that the Nintendo expects to ship 2 million units for its fiscal year ending in March 2017, and that after its full reveal, consumers would understand the differences between the Switch and 3DS. As was widely rumoured , that “new concept” involves a console/portable hybrid system with two detachable, one-handed controllers that sit alongside a tablet-style screen. Nintendo is referring to these publicly as “Joy-Con” controllers, which “can be employed by numerous people for a variety of gameplay options. 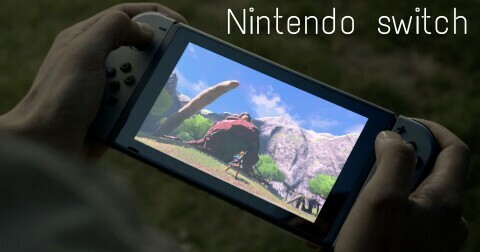 They can easily click back into place or be slipped into a Joy-Con Grip accessory, mirroring a more traditional controller” The system will also support a Nintendo Switch Pro Controller with a more traditional dual-analogue stick form factor, and support local multiplayer gaming on multiple Switch tablets at once, according to a press release. The tablet slides into a small a dock to connect to the TV, as which point the controllers can be slid off and reattached to a central base separate from the tablet screen. On the go, the tablet appears to have a small built-in stand on the rear stand to let players prop it on a flat surface, so you can lean back while playing. There’s no indication in the short trailer whether or not the Switch includes a touchscreen , a Nintendo’s Wii U. The trailer does show a brief scene of a user inserting a small, SD-like flash memory card into the top of the system, seemingly confirming rumours that the Switch will not use physical game discs. Nintendo hasn’t revealed the device’s exact dimensions, but we’ve tried to work out how big the Nintendo Switch is with some clever analysis. The short teaser trailer briefly showed gameplay footage from The Legend of Zelda, Mario Kart, Super Mario, and Splatoon series, as well as third-party titles in the Skyrim and NBA 2K franchises. A Nintendo-published list featuring a “sampling of Nintendo Switch partners” includes major publishers such as Square Enix, Sega, Konami, Activision, Bethesda, Capcom, Take-Two, Warner Bros., EA, Codemasters, and more. Nvidia has confirmed that the Switch is powered by a custom Tegra processor that is “based on the same architecture as the world’s top-performing GeForce gaming graphics cards.” No tech specs have yet been provided, but Nvidia promised a “revamped physics engine, new libraries, advanced game tools and libraries [and] new gaming APIs to fully harness this performance,” as well as “hardware-accelerated video playback and custom software for audio effects and rendering.” Read our separate story on Nintendo Switch hardware specs for more details. Following the Nintendo Switch unveil on October 20, a few titbits of concrete information have now dribbled out. Here’s a quick round-up of what we now know about the Nintendo Switch’s features, functionality, specs, and games. Nintendoconfirmed to IGN that “the main unit of Nintendo Switch is the unit that has the LCD screen.” The dock’s main functions are TV output and power/charging, Nintendo said, which suggests the dock won’t actually have much in the way of additional hardware to enable higher-fidelity play on an HDTV. The Switch can’t play physical 3DS or Wii U games : This Destructoid translation of a Japanese Famitsu story confirms that the Switch will not play physical games from Nintendo’s most recent consoles. We’re not holding our breath that downloadable 3DS or Wii U titles will be supported, either, due to the internal architecture changes to the Nintendo Switch processor. Older, downloadable Virtual Console titles aren’t out of the question, though. Switch comes with two Joy-Con controllers (left and right) to snap onto that LCD screen, according to that Famitsu translation. Nintendo wouldn’t comment on whether the TV dock or Joy-Con “grip” handles come in the standard package, which strongly suggests that there could be lower-priced bundles that don’t include these “optional” accessories. Skyrim and NBA 2K are not actually confirmed for the system: Despite being the only third-party titles to feature heavily in the Switch trailer, Bethesda and 2K Games both told Polygon they couldn’t confirm whether either title was actually in development for the Switch. That’s especially odd, since developers like Ubisoft and Square Enix have already announced their intentions to make specific games for the system. Switch will support Unreal Engine 4: This isn’t a huge surprise, since Epic Games was listed as a partner in yesterday’s trailer, but it’s still nice to get direct confirmation via tweet . While we’re at it, the system has Unity game engine support as well (much like pretty much every other device with a microprocessor). Switch will support Nintendo Amiibo figures: Nintendo tells IGN that your figures will be recognised by compatible games on the new console. That statement comes from a Nintendo UK spokesperson speaking to Eurogamer about the trailer’s production. The trailer itself did warn at the end that “game footage not final; graphics and features subject to change.” Still, the spokesperson’s statement is a much more direct suggestion that the pre-rendered footage in the trailer is more a proof of concept than a direct demonstration of the Switch’s hardware power (or software design). Splatoon players—revealed that the actors held dummy units with blank screens during filming. That wasn’t a shock to some eagle-eyed trailer watchers, who had already noticed some clipping problems between the scenes shown on the Switch tablet and the people playing those games. King Boo. Many Mario Kart obsessives thought the giant ghost’s appearance in the Switch trailer presaged a glorious return for a character that was last playable in 2008’s Mario Kart Wii. Now, much like King Boo himself, those hopes may end up being ethereal.